/ Modified feb 3, 2016 2:35 p.m. 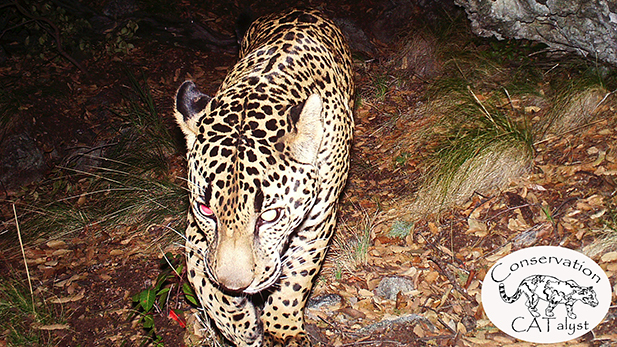 The Center for Biological Diversity in Tucson has released the first video of the only known jaguar in the United States. The video shows about 40 seconds of El Jefe, the jaguar that's been seen in still images. He is shown walking toward the camera during the day, away from it at night, and across a mountain stream. It shows he is eating well and is healthy, said Randy Serraglio, a conservation advocate with the Center for Biological Diversity. The center released the video with its partner Conservation CATalyst. That group is the only organization researching jaguars, after the University of Arizona's research project ended. Serraglio described the video as a special opportunity to see a secretive animal. "To see him in the wild, acting naturally, is really a thrill. But it also gives us important data that will help promote jaguar conservation," Serraglio said. Jaguar habitat conservation is one of the Center's goals, and it opposes the proposed Rosemont Copper Mine in the Santa Rita Mountains, because the site is within a half mile of places where El Jefe has been photographed.